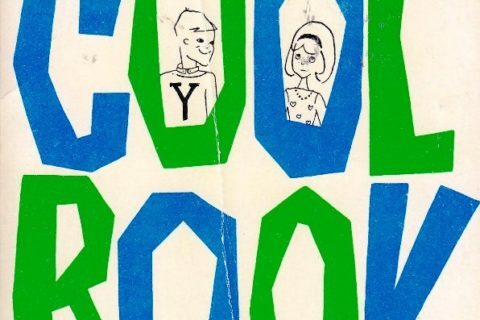 This book is ten different kinds of awesome! I want to sit around drinking milk and playing records. Ah, the good old days! I was lucky enough to trip on it at our library’s used book sale. I have no idea how it ended up at our place, but it looks like it was a textbook refugee from a junior high school home economics class. (Do they still call it Home Ec?) There is actually a ton of interesting information here. 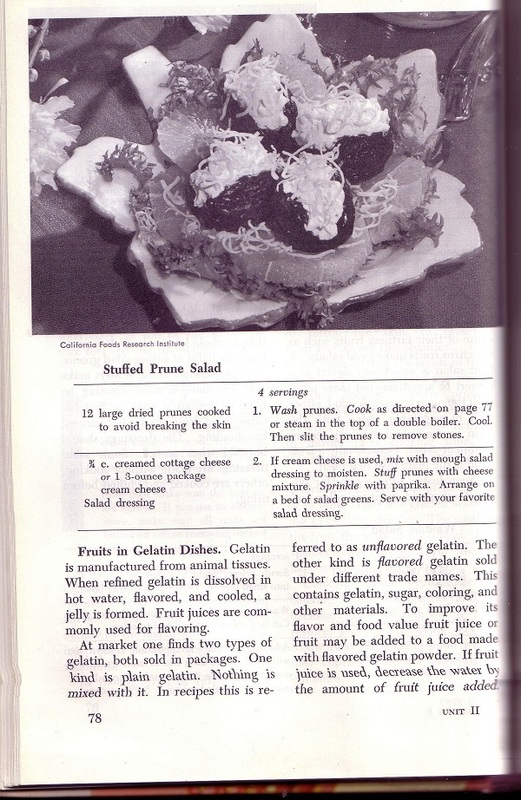 A prune salad recipe (I wish that picture was in COLOR! 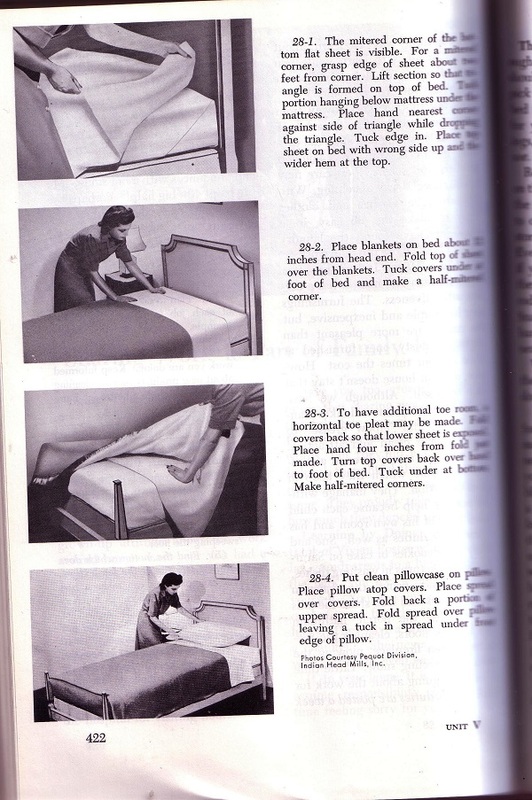 ), how to make a bed, home decorating, caring for the kids, etc. It’s interesting to note the gun on the desk in the two boys’ room. It looks like there are boots and a hunting coat on the chair in the foreground, as well. I guess hunting was an expected pasttime for boys in that era. Or else one of them is planning to go all Amityville Horror on his parents and siblings and shotgun them to death. 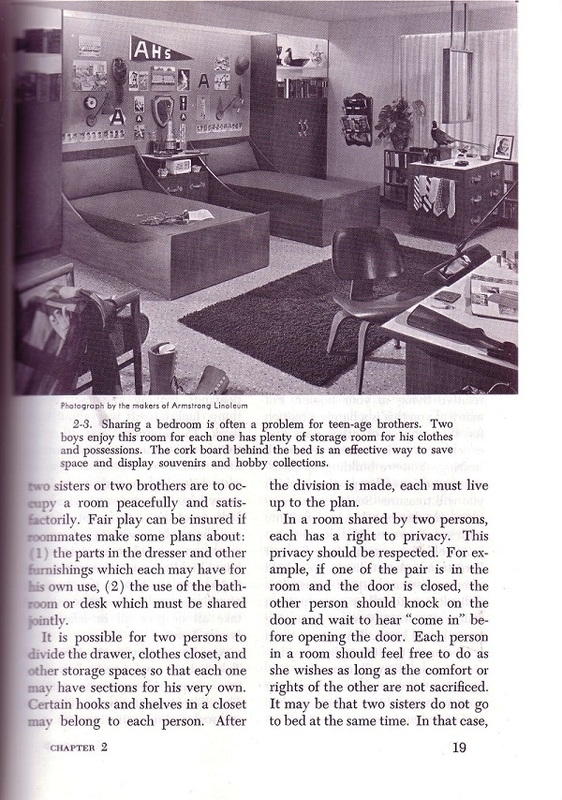 Still, that room is entirely too neat and organized, even for teenage boys from 50 years ago. The teenage brothers’ room is great. Mom finally gave up on us ; kept our door shut and told us that if we caught a disease from the “nastiness” we had to pay the doctor’s bill. Thank God that prune salad picture isn’t in color! 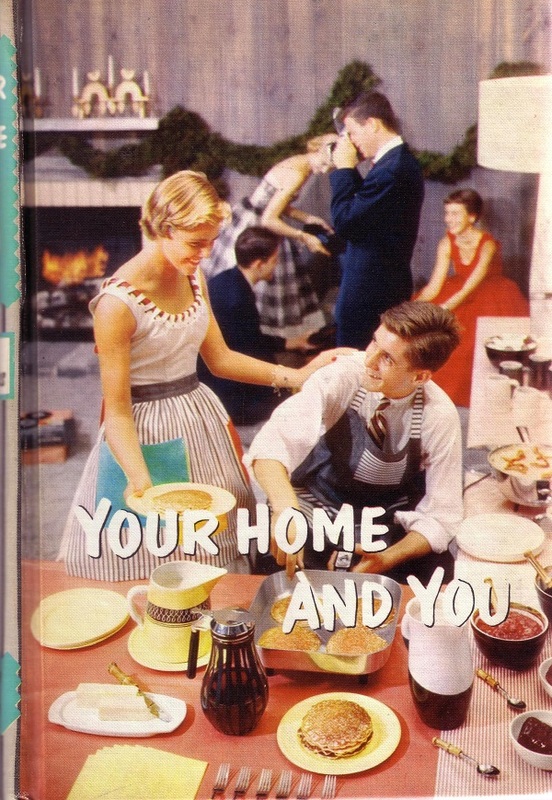 I work with culinary history collection that includes not only recipe books, but publications on household management, how to be a host/ess, domestic and social history, etc. I only WISH we had this one! It’s perfect! 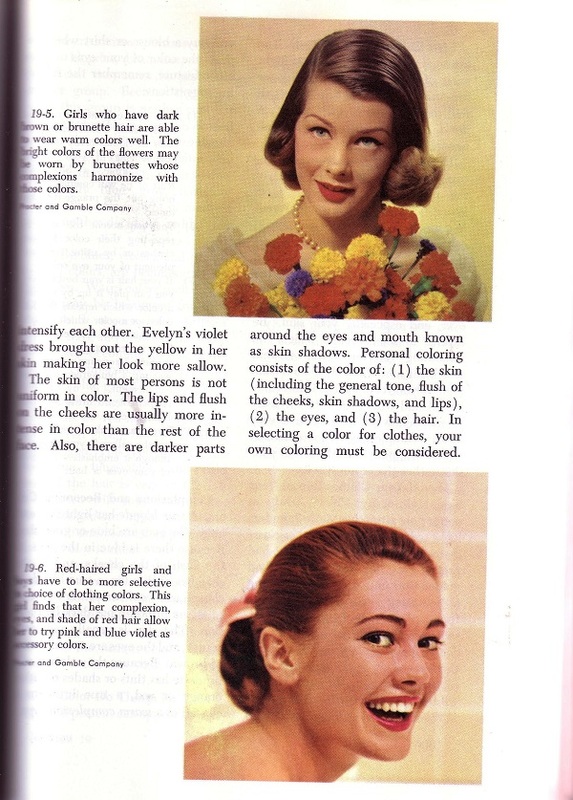 Oh, and I probably CAN find a color photo of something very much like that prune salad—and much, much worse! 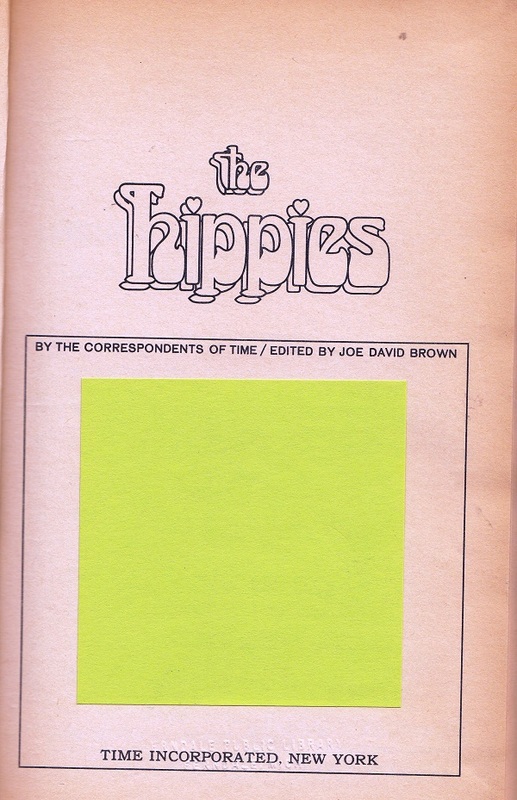 You can really see why the 60s happened with this book. 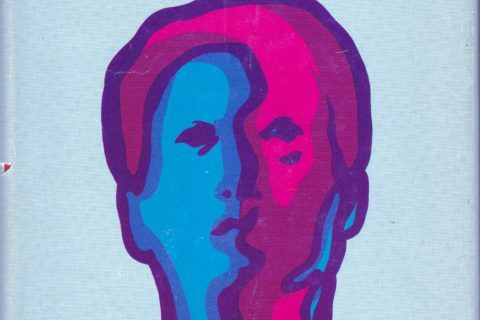 On the front cover, it looks like the boy standing in the background is crying … what the heck? Or is he perhaps taking a photo? An excellent submission! 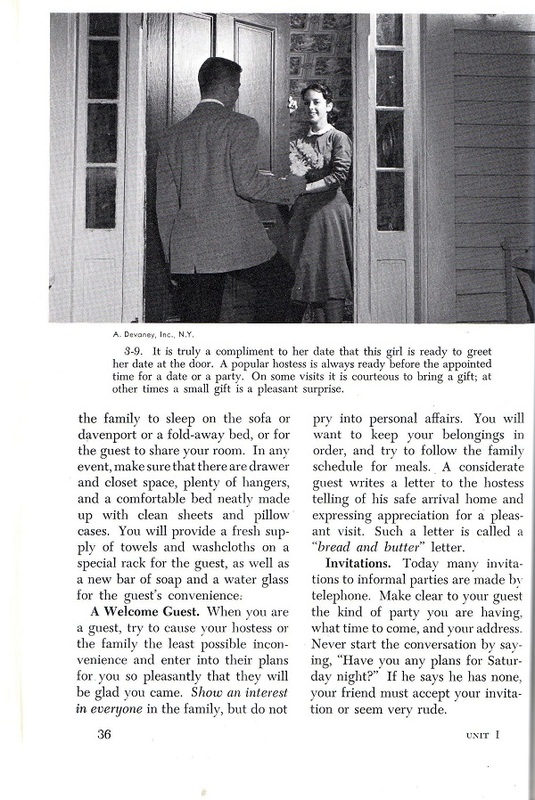 As funny and archaic as this all seems, it still has some basic merit – the principles behind the dated photos and instructions remain the same. I sometimes think that it wouldn’t be such a bad idea to go back to some of these basic teachings! Is there really anything wrong with a neat appearance or being punctual? And no, I’m not 80 years old, either! I like prunes. I think I’d like prunes stuffed with cream cheese. I’d leave out the salad dressing (do they mean Miracle Whip?) and the paprika. What is the difference between “soap and water clean” and “well scrubbed?” Did that mean that boys didn’t use soap, or that girls didn’t use scrubbrushes? I’m amused at how similar the girls with “different” coloring are. Because if you have white skin and light brown hair, you’re going to have to dress completely differently from a girl with white skin and slightly reddish hair, who in all seriousness is probably your cousin. My mother tried to teach me about “mitered corners” once. I just stopped making the bed after that. What is the thing that looks like an empty window frame, hanging above the pheasant and tie rack in the boys’ room? Come the holidays, I’m DEFINITELY having a evening pancake party in my living room. Gah! All those records…. in a pile? They’re going to get scratched. This is sweet. My life really was like that for a few moments. I can’t say things are any better now. Innocence lost seems to be gone forever, but it’s more than a little sad that we lose much more than innocence. Is it really better to see a gun in a boys room and wonder if he’s a potential murderer? I like the idea of his being a hunter much better. OMG, I want this book. 1. I love the cover. The girls are all in summer dresses, but the decorations and fire in the fireplace scream Christmas party. I also love how the boys are in jackets and ties and the girls in nice dresses, like it’s an evening party, and yet they are making breakfast, on the coffee table. 2. “Remember, it’s easy to smile when you feel gay and happy.” Ah, back when gay didn’t mean gay gay. 3. Someone could get hurt in that boys room. And I’m not talking about the guns. Boys roughhouse. Look at that hard terrazzo floor and the sharp edges on all the furniture. They’ll put their eyes out. 4. Thank God that prune salad isn’t in color. I second that. 5. Why is “soap and water” and “natural” in quotes? 6. The boy playing the record player has a weiner in his crotch, while the girls are holding their jugs of milk infront of their breasts. Early subliminal advertising? Can I have this book? PLEASE, PLEASE, PLEASE? @Julie – I think it’s a mirror – probably double sided so the boys don’t have to fight for it. And I agree with Jennifer. I just got on my niece this morning because she doesn’t bathe every day and I just about died last night when my nephew spoke to me and I realized he hadn’t brushed his teeth. (She’s 15, he’s 11.) It’s so disgusting. We need a return to many old fashion values – like staying clean! I notice the brothers’ beds are impossible to make! Also, what is that square frame thing hanging down from the ceiling?? Thank you, Polly, for asking the very question I was going to raise. I taught teenaged kids for several years and can’t imagine any of them getting together to make prune salad, but then they weren’t the type to put on a record in their bedroom with its stuffed pheasant. Hey, it’s Wally and Beaver’s bedroom! Either those beds are tiny (as in toddler-size, not twin) or that is a huge bedroom those two teen-age brothers share. When my sister and I shared a room, it was maybe a quarter that size. Here in Vermont, every Middle School aged boy and girl participate in Youth Hunting Weekend, and many of them bag a deer! Let me know if this one goes up for sale! 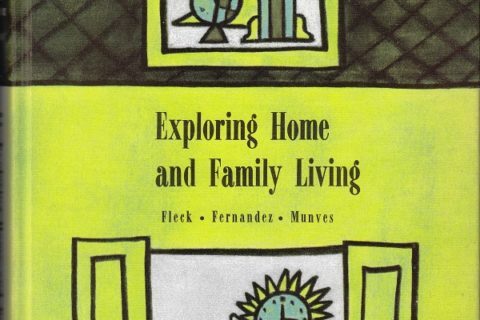 To answer what may or may not have been a rhetorical question, home economics is now officially called “family and consumer sciences,” although everyone still called it home ec when I was in junior high less than a decade ago (when we had to take it). I find it funny that a book for teens goes into such detail about the types of gelatin available. I believe that prune salad was the monster in an early episode of ‘Quatermass’. 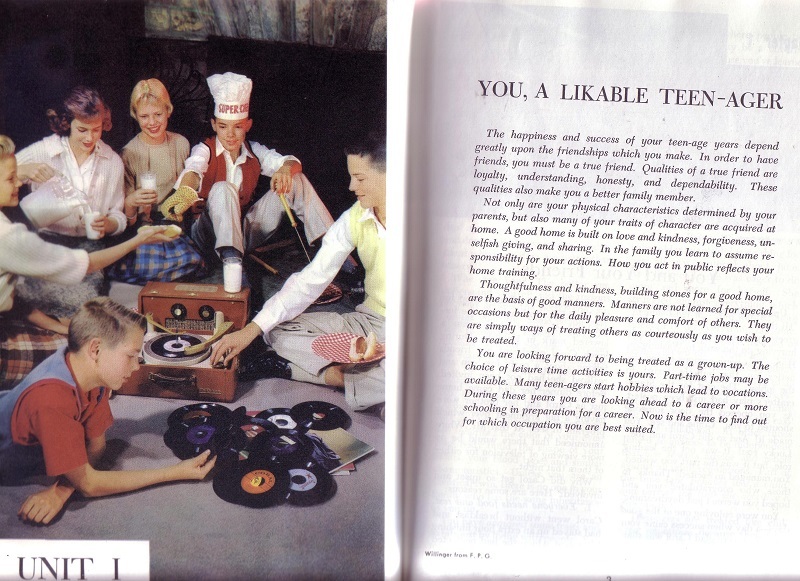 On the other hand, ‘Likeable Teens’ is a potentially awesome band name. @ Angel: I do like the idea of ‘Youth Hunting Weekend’ – if you run a youth to earth, do you get to keep him/her? I think that is a double-sided mirror that is hanging down. They have a beagle on their dresser! I think you should put this one up for auction – I would definitely bid high for this gem!! Did anyone else notice how uncomfortable those dresses look? Do you see how the armhold is cut very high? The fabric is cutting into the girl’s underarm. I had dresses like that! (And yes, I’m that old.) What was really bad was when you started sweating. The font on the cover looks like the same font they used on freakin’ “Full House”. In fact I thought this was gonna be a book about FH, ugh. I always hated that show even though the other kids in my class circa 4th grade loved it. These kinds of books never make me long for the past. They are all very staged and fake IMO. I couldn’t resist; I requested this book through our consortium loan service. However, they only had the 1942 edition, so it should be even better! Who has a bedroom that big? Maybe the Prince of Wales. Who else was reminded of ‘A Clockwork Orange’ by the milk picture? And yes, Mona, that room is the size of an aircraft hangar. I KNEW I’d seen something like that prune mess before–IN COLOR. As to the frame hanging over the desk, I think it’s supposed to be a shelf of sorts. My aunt and uncle had a similar hanging shelf between their living room and kitchen – though theirs had more than one shelf and they were wide enough to set stuff on. Those stuffed prunes look like the eggs from “Alien”.